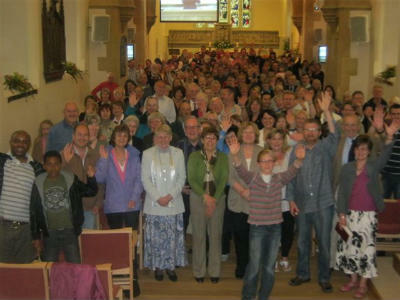 Ever wondered what a church service might be like, or what you might find there? At St Mary's, we have a rich mix of traditional, family-friendly and contemporary services each Sunday. And we're passionate about them all - though only the clergy are likely to be found at all four! Click here for details of this month's services. Also check the Homepage for the Sunday Services in the coming weeks. A more traditional service, accompanied by the Organ or Piano; using Common Worship or Book of Common Prayer and with Holy Communion on some weeks. Contemporary service with our worship group for all ages. Including Holy Communion, Baptism and Café Style services. Children’s groups run on the 1st, 2nd and 3rd Sunday of the Month. The 4th and 5th Sunday is All Age Worship. Refreshments are served after the service. Contemporary Worship on the 1st and 2nd Sunday. On the 3rd Sunday at 5 pm we have a Come Closer service, an opportunity to draw close to God in the intimacy of the Father’s love. On the 4th Sunday we host the Heart 4 Harlow Service. On the 5th Sunday there may be Soaking Prayer; a time to rest in God’s presence. 'Holy Communion' (a term that the Church of England uses for sharing bread and wine in thanksgiving for Jesus' death on the cross for us) is celebrated every Sunday of the month at the 8 am service, the 3rd Sunday at the 10.30 am service, and the 1st Sunday at the 6.30 pm service. 'Baptism,' (God's mark of inclusion in the worldwide church) is available at the 10.30 am service on the 2nd Sunday of the month. There is a preparation course for everyone seeking baptism, whether it's for yourself, or for younger children and infants. Visit the Baptisms page on this site for more information about baptism at St Mary's.